Bow Valley College had received a multi-million dollar endowment to name its new school of business and wanted to introduce it to Calgary. The Dean wanted to present the school as a legitimate alternative to the University of Calgary and Mount Royal University by positioning it as fun, clever, and “not your parents’ stuffy business school” while not detracting from the quality level of education offered. I worked with my team to develop the idea of “Chiu’s Rules of Business”. The premise was that we’d take the ubiquitous business introduction, the handshake, and demonstrate it in non-conventional ways. We also wanted to accentuate the educational aspect of it by presenting it as a guide. We had a very limited budget to work with so we decided to work in an illustrated solution. We used photos of ourselves fist bumping, doing high-fives, and other less ordinary business handshakes to demonstrate that the Chiu School of Business was not ordinary. 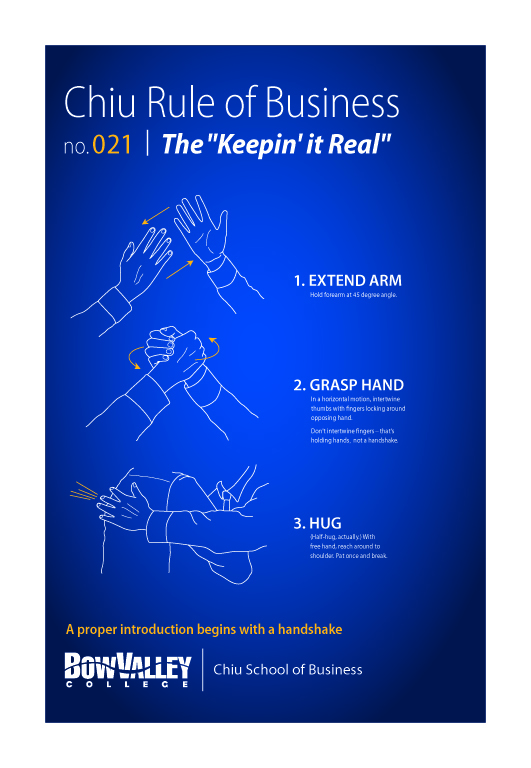 We developed an interactive portion to the landing page that allowed users to name, design, and generate their own handshakes using pre-drawn hands and a GIF generator. Users were then encouraged to use Instagram to share their creations with the community.